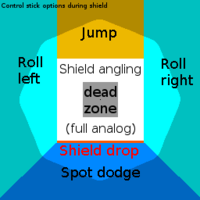 Shield platform dropping, commonly called shield dropping, is an advanced technique in all Super Smash Bros. games through Super Smash Bros. 4. It involves dropping through a soft platform while shielding by tilting the analog stick down. The term "shield drop" should not be confused with "dropping one's shield", which refers to when one lets go of the shield button and stops shielding. The technique is simple to execute in Smash 64, as there is no sidestepping in that game to interfere with the function of pressing the stick downward while shielding. Shield options with the control stick in Melee. As the sidestep is introduced in Melee, pressing the control stick too far and too fast results in a sidestep. Since this makes it hard to platform drop while shielding, the player must either be very precise with their inputs or press the stick down during a different action than shielding (such as a dash or shield stun) with close enough timing that the sidestep window is closed but the drop window is still open. Falco performing a shield platform drop on the floating platform of Smashville. In Brawl, while the conflict between sidestepping and dropping persists, there is now a small window where a drop can be made without triggering a sidestep: the player must move the control stick down to 68.75% of its maximum downwards angle in 6 frames without moving it past 70% of said angle in 4 frames. In Smash 4, the technique remains the same as in Brawl. However, it is possible to perform a down smash or grounded down special immediately out of shield on a platform if the control stick is moved down just slightly less than that of the regular shield drop angle. Additionally, and perhaps most interestingly, Yoshi loses the ability to shield drop and perform the previously mentioned technique due to his unique shield. The primary use of shield dropping is to punish the use of moves on a shielding player on a platform, as it allows players to quickly do an aerial out of shield to punish ending lag. Shield platform dropping opens a larger possibility of comboing, tech-chasing, edgeguarding, mindgaming, and out-of-shield options. The player can run and pass under the platform, which cannot be done without shielding in Brawl. This technique also gives Yoshi a quick way to act out of his unique shield, as he cannot jump out of shield in Melee and Brawl. This page was last edited on January 19, 2019, at 16:18.